If you read my last blog post, you know that if you suffer from chronic illness, you need to cool the flames of inflammation to reverse symptoms. Inflammation is the body’s natural response to injury or a foreign invader. However, inflammation can be a problem when you are constantly turning on the inflammatory cascade (especially with the food you eat). When this happens, your immune system starts to get out of control causing excessive inflammation in your body. You can think of inflammation as a fire burning inside your body that contributes to chronic pain and chronic immune activation. 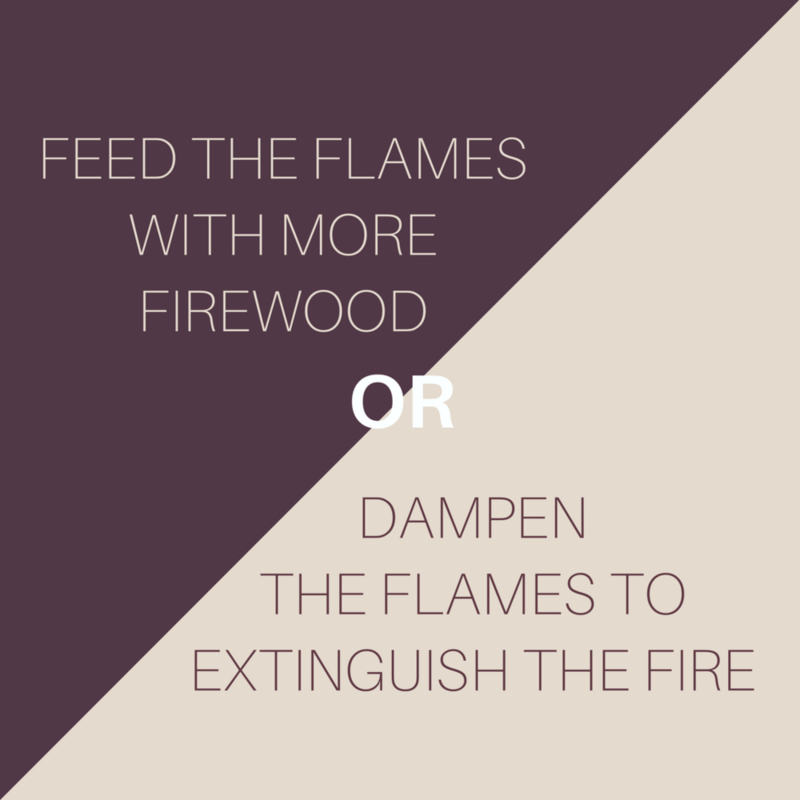 One type of firewood that feeds the fire within your body is called pro-inflammatory foods. Food additives, such as MSG, nitrites and nitrates, preservatives, food dyes and artificial flavoring and sweeteners. Something I like to focus on with my clients is to think more about what to include rather than exclude so the feelings of deprivation are limited. Focus on filling your meals with anti-inflammatory foods that act as an extinguisher and cool the flames of inflammation. *If treating severe pain, autoimmune condition, IBS/IBD, Candida, SIBO Some of these items may be inappropriate initially for you. Vegetables minimally 5, up to 12 servings a day. 5 servings is 20 ounce, aka 1 pound and 4 ounces! Attempt to eat all the colors of the rainbow daily to maximize the phytonutrients, and antioxidants available for your body to extinguish the inflammation. Eat your vegetables with some healthy fat and a little acid. This could be some steamed vegetables then drizzled with olive oil and a squeeze of lemon, or it could be a salad with an apple cider vinegar dressing. Not a fan of any acid with your veggies? You could have a glass of water with you meal with a quarter of a lemon or lime squeezed into it. Doing this will maximize the nutrient absorption from your vegetables. Fruit 0-3 servings a day. Try your fruit with a little protein and or fat so that the fruit’s sugar does not hit your bloodstream too fast. Eat your dark colored fruits like blueberries, blackberries, raspberries, to maximize your antioxidant and fiber intake that will decrease systemic inflammation. Protein, approximately 1 gram per 2 lbs of body weight. When eaten in excess it can cause more inflammation. The digestive system does have a physiological limit on its ability to absorb protein from a single meal within a 4 hour window. Depending on the health of your digestive system it is between 25-50 grams of protein. Factors that influence the body’s ability to process protein are having 1. adequate stomach acid 2. adequate digestive enzymes. Over consuming protein has the potential to go rancid in the digestive system and create reactive oxygen species, which perpetuates an inflammatory process in the body. Vegetarians: Ferment your beans and soak your nuts to decrease the phytic acid and lectins in your beans and nut prior to eating them. These anti-nutrients can play a significant role in chronic systemic inflammation and properly preparing them can decrease your exposure and protect your gut lining from irritation. Have a hard time eating protein? Feel like it sits in your stomach like a rock? Eat your organic grass fed free range animals slow cooked in a pressure cooker or slow cooker. When the meat is “stringy,” that means the amino acids are ripe for the taking! They’ll be more easily digested and absorbed into your body’s tissues for use. Suggested healthy fats include: cold pressed oils like olive oil, grape seed oil, avocado oil, coconut oil. Eating whole foods high in healthy fats such as avocado, olives, nuts and seeds. Filtered Water 1 ounce per 2 lbs of body weight, more if you exercise, or live in an area that is hot and you sweat regularly throughout the day. Fruits and vegetables do count toward this, most fruits and vegetables range between 80-95% water, so if you’re eating 20 ounces of veggies a day, you may subtract approximately 16 ounces from your total for the day. Identify and implement lifestyle interventions to address inactivity and/or poor sleep.